20110206 - Up and only L&D to church. JG&I stayed home, they r both sick :-S L&D home and we hung out all day. I got caught up on the blog and some things around the house and packed. 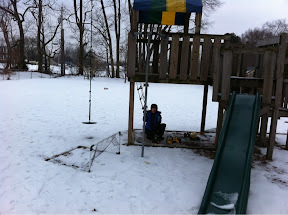 J started feeling better and went out to play in the frozen sandbox. We stayed up and watched the Superbowl and Glee. 20110205 + J no basketball, home sick with real bad cough. D over to Seth's to play. G had a friend over, who happened to have a 7yr old sister with her... so J&G played with some girls. L talked to the mom for hours, I caught on blog. All home, all guests gone, dinner and D&I out to his basketball game. They got skunked again. We tried to stop for a cup of coffee, but the place was closed. Home watched some TV with the boys, all to bed. 20110204 - Up, G home sick, worked and watched him, calls most of the time, he did good. Boys home from school, had friends over VerY LOUD!!!! Finished up the day, out for pizza, L got groceries. Home boys clnd up, watched some A-Team, bed. 20110203 - Up, exhausted from staying up doing taxes... At desk all day, even had a call after 5 as L&J went back to the school for parent teacher conferences. Out of the office, basketball experiment w/ D then getting dinner together (brats on the grill :-). After dinner took D to scouts, got gas and took back a movie.